This rectangular leather vintage purse has a 42" long shoulder strap. 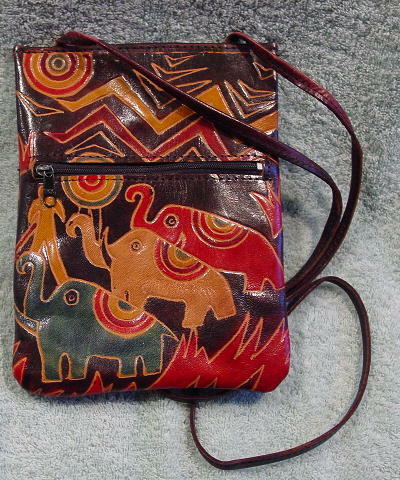 It has a dark chocolate brown background with freeform people, circles, line patterns, and elephants in green, caramel, and red. 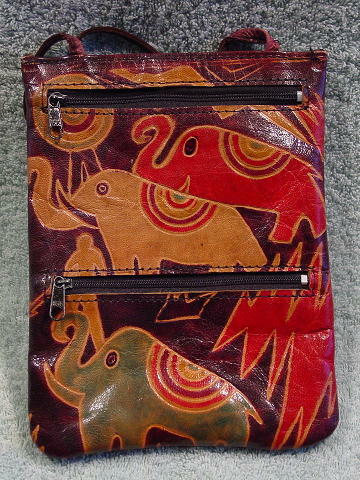 One side has a zipper compartment 5 1/2" wide by 4 3/4" high. The other side has 2 zipper compartments. The top one is 5 1/2" wide by 6 1/2" high and the bottom one is 5 1/2" wide by 3" high.